Note: Some of this information may now be outdated. You can find great deals on Sprint and Straight Talk by clicking the corresponding links. You can activate those deals by clicking the links and also find some basic information below as well as on their websites. When choosing your wireless provider, there are hundreds of questions you could have. If you’ve narrowed it down to Straight Talk and Sprint then this comparison guide is for you. Both of these providers pride themselves on having low-priced unlimited plans which will be one of the focuses of this comparison. Along with their unlimited plans, we will help you decide whether the prepaid options of Straight Talk is better for your situation than the pre-paid and post-paid options that Sprint currently has available. Look at our comparison guide below as well as the deals at the bottom. Almost everyone is at least somewhat familiar with Sprint. They’re one of the largest wireless providers in the United States and currently best known for they’re no defunct “Framily Plans” as well as offering one of the only unlimited data plans among post-paid carriers. Sprint offers a few different options on how you can get a phone that will go along with your wireless plan. This includes purchasing the phone on a 2-year contract along with a small fee, bringing your already owned phone and the newest option being Sprint’s Easy Pay option. The Easy Pay option is where well-qualified customers can finance their phones and pay monthly along with their wireless plan. As far as plans go Sprint is pretty simple and straightforward when compared to a lot of the other major carriers. As of right now, they offer a “family share pack” which pools together 20GB or more of data for a select number of lines. Their two most popular plans are the unlimited plans. They have unlimited plans for individual lines along with unlimited plans for families. Straight Talk is best known for being a cheap prepaid wireless brand where you can get unlimited plans. You can find the plans through Walmart along with their website. They sell all prepaid plans which means you need to bring a phone to the plan or purchase one of the compatible phones from their website. Their most popular plan is the unlimited everything plan. This includes unlimited talk and text along with unlimited data. The data is completely unlimited but once you hit a certain gigabyte threshold for the month (currently 3GB) your data speeds will go down to a lower speed. The current price for this plan is just $45 per month plus any other fees and taxes. They also offer an international plan for $60 per month. While this is much lower than Sprint you have to remember that with Sprint’s listed plan above it includes the subsidized price of your phone while with Straight Talk you must purchase a phone or bring your own. When you compare Sprint and Straight Talk there are many similarities. For the most part, they offer many prepaid options as well as “unlimited” data plans. As of late, not many wireless companies offer any type of unlimited plan so that means big savings if you’re someone who constantly goes over your allotment or data for the month. 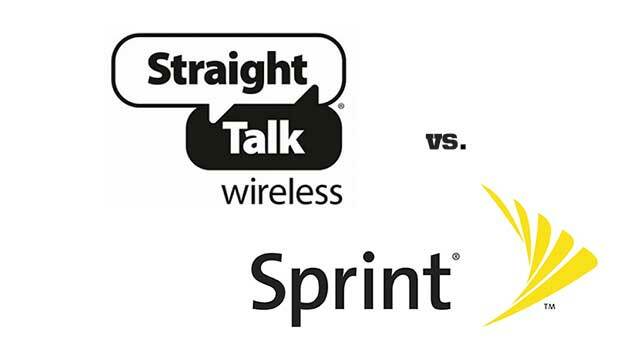 The largest similarity between the two is that Straight Talk uses the Sprint network for coverage. They also use Verizon Wireless depending on the market. This means that the coverage areas for both services are generally the same. The main difference between the two is that Sprint has an option for post-paid services and Straight Talk is entirely prepaid. Post-paid essentially means you pay at the end of each month and that you have a contract which is usually for around two years. Since you’re signing a contract this means that Sprint can subsidize the price of your phone into the wireless plan’s monthly cost so you pay $199 for an iPhone instead of the full retail price of $600+. Aside from the post-paid vs. prepaid option, there’s also a difference in the way they do their “unlimited” plans. If you’re using a Sprint unlimited plan you can use their data at the same speed throughout the entire month without any type of drop off in data speed. Straight Talk, on the other hand, will throttle you to a lower speed after a certain amount of data. This is a big difference for those who want truly unlimited data. Getting the truly unlimited data does come at a higher monthly price. Answering which service is better is generally impossible. This isn’t because they are exactly the same in ratings but instead that a wireless plan is a personal choice depending on dozens of factors. These factors include things like wanting the latest and greatest phones, wireless data coverage in your area if you’re bringing multiple people to a family plan and so on. The biggest difference between the two that might make your decision is what type of phone you want. If you’re someone who wants the latest iPhone at a price of $199 than Sprint is where you want to go. The reason is that Straight Talk is set up to be a discount carrier and it’s built for consumers who are just trying to get a cell phone for the lowest price. So if you’re a price-conscious consumer where every dollar matters in your budget and you don’t need a brand new phone then Straight Talk should be your choice. Leave your comments, questions, and reviews below to help us build a great comparison page to help consumers make the right choice. I am looking between Sprint and Straighttalk. When I called Sprint they told me they will offer me a $40/mo before taxes/fee with no contract if I bring my own phone in. That price beats Straighttalk. I have to make a decision in about 2 weeks when my current service expires. One of the things to check is to see what the coverage is like in your area. There are some areas where Sprint doesn’t have great service. Also, Sprint may be merging with T-Mobile within around a year so that might be another thing to look in to. If there’s great coverage in your area and you don’t travel much then you may want to take a great deal like that from Sprint. I have a Sprint phone, that gets great coverage in my area (where Verizon is useless). My daughters new phone is an ATT phone on the StraightTalk network, and gets terrible coverage, just about everywhere.. ??? I am in a large metropolitan area. Any ideas?